In Minor League Baseball, the players come and go. But the mascot remains. Mascots are beacons of stability in an otherwise ever-changing ecosystem, and this is why they are so beloved. They are continual bringers of joy, steady providers of mirth and reliable deliverers of merriment. They are the raging id within us all, unself-conscious, impulse-driven eccentrics of all species who are united in their steadfast desire for nothing more than a good time. If you don't love mascots, you don't love life. 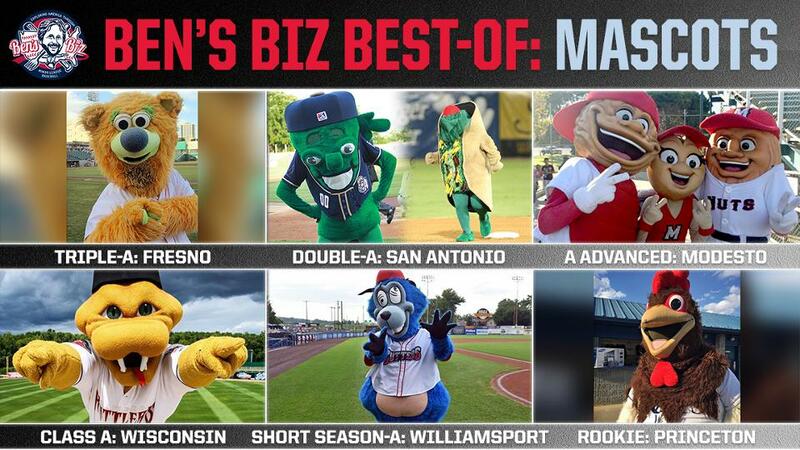 As with my previous two stories in this "Ben's Best" series -- dealing with ballparks and food, respectively -- this list of favorite mascots is bound to result in disagreement and, on the part of the overlooked mascots, pantomimed rage and silently-expressed hurt feelings. What follows is a level-by-level list of my all-time favorites, compiled meticulously in the wake of visiting every Minor League ballpark. The Grizzlies have long had a well-deserved reputation for being one of the most creative teams in Minor League Baseball, and Parker always seems to be in the thick of the promotional action. This greenish-yellow grizzly bear has gone toe-to-toe with the Phillie Phanatic, distinguished himself on the wrestling circuit and displayed on-field dance moves that are among the best in the business. His penchant for personal growth reached a new apex in 2016, when he became an ordained minister and presided over wedding ceremonies at the ballpark. Henry's Puffy Tacos, specializing in deep-fried corn tortilla tacos, is based in San Antonio. A partnership between team and restaurant led to the creation of the Henry the Puffy Taco, who possesses a literal head of lettuce. Henry became a huge hit at the ballpark, embraced by fans despite (or perhaps because of) his inability to win the nightly Taco Chase race around the basepaths. Ballapeno, a baseball-playing jalapeno, debuted in 2000 as Henry's sidekick and eventually assumed the Missions' primary mascot role. The twosome, despite their oft-contentious relationship, combine to form the most bizarre and memorable mascot duo in the Minor Leagues. Modesto, California, is in a nut-producing region. So much so that, in 2005, the city's California League team named itself the Nuts. The moniker resulted in a wizened-yet-sprightly pair of hard-shelled Nuts mascots: Wally Walnut and Al Almond. This oft-dancing duo became a trio in 2014, when Shelley the Pistachio entered the fold. Shelley -- who has charm, charisma and dance moves to spare -- brings a much-needed dose of femininity to the male-dominated mascot universe. The Phillie Phanatic helped set the template for baseball mascots, both in their anarchic spirit and the fact that they often represent an unknown species. The Crosscutters are a Phillies affiliate, and Boomer is very much in the Phanatic tradition. He's a total, unabashed weirdo, one with self-described "crazy eyes" and a fashionable pair of Chuck Taylor's. He's also covered in leaves, because he used to live in the forest and only became a mascot after a chance meeting in the woods with former Crosscutters mascot Rusty Roughcut. Roscoe the Rooster is, truly, the most unique mascot in all of Minor League Baseball. First of all, he can talk! The ability to vocalize his thoughts already puts this bipedal bird in a league of his own, but Roscoe's capable of far more than that. In addition to strutting around the Rays' Hunnicutt Field, he competes in West Virginia Championship Wrestling matches. "I've wrestled over 25 matches, won 'em all," Roscoe told me in 2016. "My finishing maneuver is the chicken wing."